Today’s blog post is a little longer than usual. If you have no interest in artificial intelligence, please scroll down to the sub-heading “Since my last blog post” to find out what I’ve been doing and to find several links to websites and video clips you might enjoy. If you don’t count blogging as social media, I haven’t blogged about social media since June 9, 2017 (6 Things Learned about Google+) and I must say that I haven’t missed it at all. I just don’t “get” some of it. I received an email from LinkedIn on Friday. It explained major changes in their newsfeed algorithm. Granted, they lost me at the word “algorithm” because I pretty much glaze over at any reference to math, but I kept reading. It didn’t take me long to learn that if I don’t mix up my posts on LinkedIn with video, images, and text, I’ll just be whistling in the wind. Sounds like I need to just close my account since I don’t do videos. Even though I’m no authority on the topic of social media, occasionally I try to point you toward people who can help you better understand and utilize it. 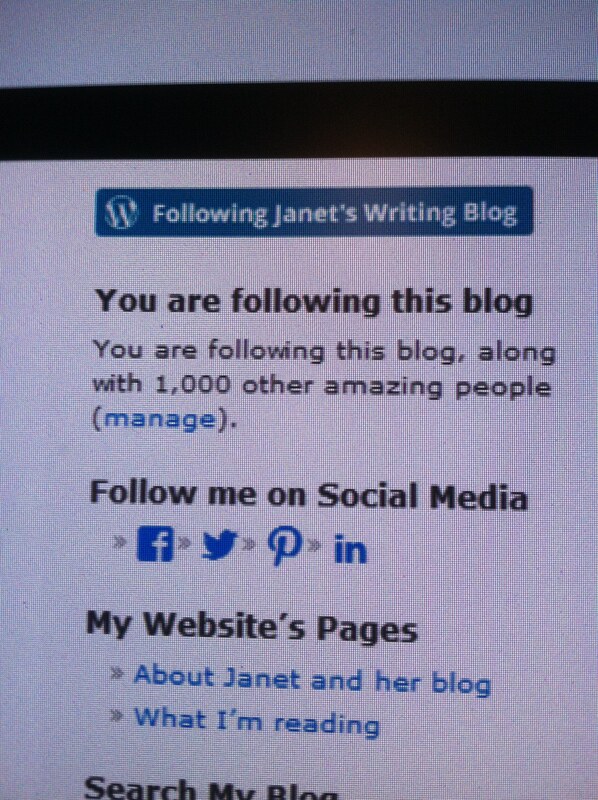 There is a blog about blogging by Janice Wald that I follow. I read her blog several times every week and have found it to be informative. Always. Her February 25, 2018 blog post, “RankBrain: This is Why You’re Doing SEO Absolutely Wrong” (https://www.mostlyblogging.com/how-does-rankbrain-work/) is a prime example of how helpful Ms. Wald’s blog posts are. The changes RankBrain brings include a lessening of the importance of using long-tail keywords. I must admit that my brain glazed over when I read in Ms. Wald’s blog post, “Use only one (medium tail) keyword and then add LSI Keywords (Latent Semantic Indexing Keywords),” but I kept reading and so should you if you’re trying to be found on Google. Since Janice Wald is much more computer savvy than I am, I refer you to her blog post if this is something you want to understand as things constantly change. Of course, now I’m more nervous than ever about choosing titles for my blog posts and making my posts interesting enough that people will not only find them on Google but will also click on them and read them before bouncing around to other search results. I’ve gotten some great tips from Janice Wald’s blog over the years, but the post by guest blogger, Nidhriti Bhowmik, on her August 12, 2017 blog (http://www.mostlyblogging.com/chatbot/) keeps ringing in my ears. Her February 25, 2018 blog referenced above brought guest blogger Nidhriti Bhowmik’s post to mind. Mr. Bhowmik’s post prompted me to draft a blog post about my reaction last August, but I hesitated to post it because of its negative tone. I reread it a few days ago. Since it still struck a nerve in me, I decided to edit the post I’d drafted and include some it in today’s post. I don’t doubt that Mr. Bhowmik is gifted when it comes to computers. It goes without saying that he knows much more about computers than I do. I just don’t think what he proposed in his August 12, 2017 blog post is the way I want to communicate with people. Maybe this works in other businesses, but I’m trying to establish myself as a writer. Using artificial intelligence to discern what search engine users are looking for makes sense to me, but using it to communicate instead of speaking for myself is a whole different can of worms. I suppose it’s similar to the old-fashioned form letter, yet it’s different. A person actually wrote those form letters, but computer-generated tweets and other forms of communication just aren’t my style. Mr. Bhowmik’s guest blog post was about a new “hack” designed to make my life simpler. As a middle-aged woman just trying to learn the art and craft of writing so I can write a novel, I could use some things that would simplify my life, but I guess I’m too old-fashioned to latch onto the one explained in Mr. Bhowmik’s post. Mr. Bhowmik’s topic was something called chatbots. He is an “AI Evangelist.” Artificial Intelligence Evangelist. I’d never heard of chatbots, but that’s not surprising to me or anyone who knows me. I read the post and it just made me sad. In a nutshell, it seems that a blogger can sign up to have a computer generate all their tweets, Instagram whatevers, etc. 24/7. I’ve already gotten caught in the web of something like that. I tried a free trial of a product I won’t name. Since it was free, I couldn’t seem to get rid of it for months. It sent messages to people who followed me on Twitter to thank them for following me AND encouraged them to sign up for the product I won’t name. I prefer to personally thank the people who follow me on Twitter. Let’s face it, there aren’t that many of them. I don’t want a computer program interacting with the world as me around the clock. It is possible that a computer program can generate higher-value content than I, but that’s just not the way I want to communicate. I don’t want you to feel valued because a computer program simulates conversation with you. I want you to feel valued because you are valued. And if you have “pain points,” I’m probably not the person you need to be dealing with anyway. Have we completely lost our ability to talk to each other? I enjoyed watching “The Jetsons” on TV when I was a child in the 1960s. The technology they used was science fiction then and it was fun to imagine living in such a universe. But you know what? Even the Jetsons talked to each other. Sonni signed up to receive my sometime-in-the-future newsletters. Sonni has been generous with what she’s learned from experience since my early days as a blogger. Thank you, Sonni, for your continued support of my writing journey. In addition to daily advocating for reforms to the prison system in the USA, Sonni is a gifted writer, pianist, and composer. You can find her blog at http://mynameisjamie.net. Her improvisational music on the piano is amazing to someone (me) who took piano lessons and still can’t play well. You can find Sonni Quick’s music on YouTube at https://www.youtube.com/channel/UCv6dycDAXCytFYvf–Njxrw. I’ve finished reading several novels since last Monday’s blog post. I enjoy reading fiction and seeing how published authors write. When I’m reading, it’s not just for fun. I’m looking at writing style, voice, point-of-view, plot, sub-plots, and always watching for a clever turn of a phrase. That said, I admit I’ve spent more time reading than writing since my blog post last Monday. I continue to work on my character profiles. With the theme of my historical novel manuscript, The Spanish Coin, established, I’ve changed the first scene in the book. That shifts everything I’d already written in the outline. This is all part of the process, and I love it. I wrote 1,200 words one evening as I brainstormed my new hook. After using the same hook for The Spanish Coin for more years than I want to admit, it’s refreshing to start the story with a different incident. I hit a milestone last week on my blog. I now have 1,401 followers, which I can’t quite get my mind around. I hope you have a good book to read that wasn’t written by a computer. I’m reading The Atomic City Girls, by Janet Beard. If you’re a writer, I hope you have quality writing time using your own intelligence instead of the artificial kind. Please take a minute to fill out the form below if you haven’t already, if you would like to be on my mailing list for my sometime-in-the-future newsletters. By the way, that is completely separate from signing up to follow my blog. Please do both, if you haven’t already. Thank you! Getting back to Jeanne Robertson, if you don’t know who she is, please scroll up to the second paragraph under the “Googles’s RankBrain” subheading. If you haven’t been exposed to her North Carolina humor, you need to do yourself a favor and watch some of her video clips on YouTube, such as this one, https://www.youtube.com/watch?v=-YFRUSTiFUs. You’re in for a treat! Here it is the end of the third week in January and I’m just now articulating my 2017 writing plan of action. The name itself sounds arrogant, but that isn’t my intention. As an aspiring author, I need a plan and I need to act. I call it a “plan of action” for my own encouragement and not to impress anyone. In real estate, the maxim is “Location, Location, Location.” If I am to establish my “brand” as a writer, my maxim must be, “Consistency, Consistency, Consistency.” Just as a character in a work of fiction has a distinguishable voice or way of speaking, my voice on social media needs to be consistent. My style of writing needs to be authentic and not all over the place. Likewise, I need to be consistent in my presence on social media. If I just blog on a whim, my audience will fall by the wayside. If I Tweet with no regularity, I’ll lose my followers. My challenge in 2017 will be to use social media on a consistent basis while making time to write. Being a relative newbie in the world of social media and not being technologically savvy, most days I feel overwhelmed by how much I have to learn. My actual writing has been taking a back seat lately. I must strike a healthy and productive balance in 2017 as I work toward getting my novel manuscript published. If I don’t, all the years I’ve spent writing the book and all the months I’ve spent sharpening my social media skills are all for naught. Writers are instructed to identify an ideal reader. This isn’t a real person. This is an imaginary person you write for. Some writers give this ideal reader a name and they have a visual concept of what that person looks like. I’ve concluded that my ideal reader is complex. Ultimately, my ideal reader is someone who enjoys southern historical fiction, has an interest in history but also keeps up with current events. My ideal reader is a well-informed citizen and not just a spectator. My ideal reader is not offended if I occasionally reveal my beliefs or civic concerns on social media. My ideal reader is not only willing to have his or her assumptions questioned but actually seeks out such literature. Does such a person exist? I’m counting on it! It’s easy to sit here and wax poetic about my plans, but now comes the hard part. From what I’ve read, I need to determine on which social media platform(s) my ideal reader hangs out and then concentrate my efforts there. Try to use my blog to increase my exposure as a writer & establish my brand. Set goals for number of followers & number of bloggers following my blog. Make a list of blogs I’d like to guest blog on. Figure out how to make necessary changes to my blog’s set up to improve its Search Engine Optimization. By the way, if you have trouble reading my blog on your cell phone or tablet, please let me know so I can take actions to rectify the situation. Please let me know if you have difficulty seeing or downloading photos I include in some of my blog posts. I need feedback about any issues you’re having. Study my end-of-year 2016 reports, stats, etc. & determine what worked & what didn’t work & what I need to do differently in 2017. Try to use Twitter to increase my exposure as a writer & establish my brand. In order to establish my brand, I need to create more original content as opposed to primarily retweeting content generated by others. Set goals for number of Tweets and number of followers. Try to use Pinterest to increase my exposure as a writer & establish my brand. As with Twitter, I need to create more original Pins. Janet’s Writing Blog is my only Pinterest board that is 100% original content. Evaluate my boards and the order in which I display them. Set goals for number of followers for these boards: The Writing Life; Novel in Progress: The Spanish Coin; Blue Ridge Mountains; Great Smoky Mountains; I Need the Light; Sequel to The Spanish Coin; Janet’s Writing Blog; and Blog Odds & Ends. Try to use Facebook to increase my exposure as a writer & establish my brand. My personal page is just what it sounds like. My “Janet Morrison, Writer” page is where people who are interested in my writing can “Like” me. Set goal for number of “Likes” by Dec. 31, 2017. Goodreads.com is a website I enjoy as a writer and as a reader. It’s free to create an account and then to participate as much or as little as you wish. You can search for books or authors and create a list of books you’ve read, are currently reading, or want to read. Book reviews and book ratings on a one- to five-star system are encouraged but not mandatory. I have been lax in writing reviews, and I don’t always rate books I’ve read. I need to increase my activity in 2017 in order to get the most benefit from this completely free website. Oh – and there are a multitude of book giveaway contests for account holders. Try to use LinkedIn to increase my exposure as a writer & establish my brand. Try to use Google+ to increase my exposure as a writer & establish my brand. Review analysis for end of 2016. Figure out which changes I can make and how to accomplish them. Get 2 beta readers to give me feedback. Hire a professional editor to do a developmental edit. Pursue getting a literary agent or self-publishing. Only time will tell how successful I am in carrying out this grandiose plan. All these social media activities are touted as being necessary for authors. Truth be told, I’d rather just write! If you took the time to read this entire blog post, you deserve a prize. I don’t have any to offer, but you do have my sincere appreciation. Until my next blog post . . . In your chosen work, do you make an annual written plan?